There are many compositional techniques to creating exciting and interesting photography. One such way is to create depth and a sense of space in the image. Depth between the front and back of the image frame will increase visual interest in your composition for your viewers to stay engaged. There are plenty of times when a flat composition becomes very effective but there are ways to make visually interesting also ( more on that in a later post). There are a couple of ways to get depth. A near far composition, repeating shapes and leading lines to name a few are all excellent starting points. For this discussion we will be speaking to the near far technique. The near far technique is achieved by having a dominant foreground element as the anchor of the image. Usually achieved with a wide angle lens to enhance a size difference with the rest of the landscape in the far distance. Hence….. near and far. 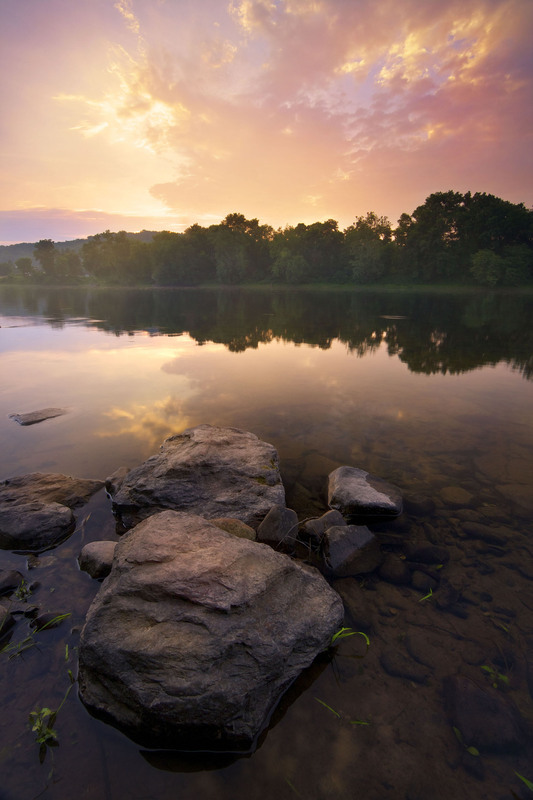 In this image , shot on the Delaware river in Worthington State Forest, a wide angle lens was used to make the rocks big. Now clearly the rocks are not as big as the trees in real life but by using the optics in combination with the composition a great deal of depth in the image has occurred. Near objects in compositions can be rocks, flowers or just about anything as long as it relates to the scene. The near object relationship with the background will help deepen the connection for your viewer. Usually an already natural foreground will do the trick. Experiment with this technique with different sized and types of foreground objects and you will begin to see a big difference in your landscape images. It made the biggest difference in mine.